“The card is symbolic of your personal beliefs and what will bring you happiness in your life. 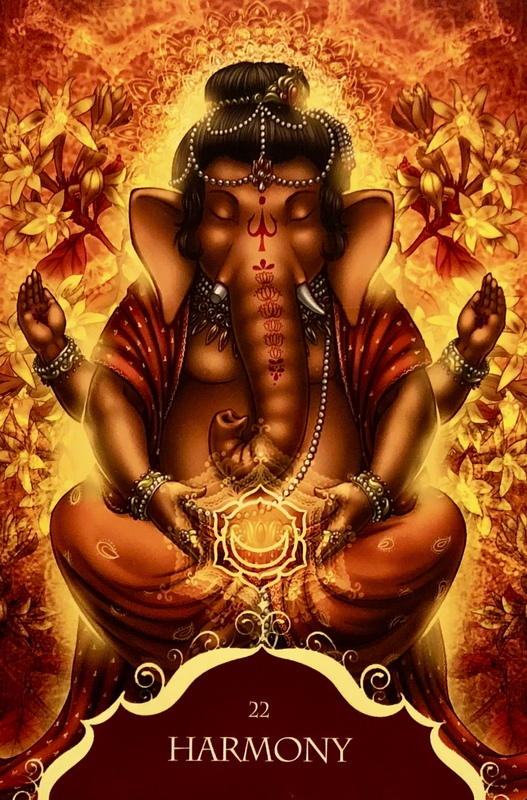 Ganesha is asking you to remember to radiate warmth and energy. Take some time to reflect on your personal values and attitudes. What do you believe will bring you the outcomes you are longing for in order to have a complete and happy life? The colour orange can refer to a period of socializing, activity and new adventures. Orange is the colour of the Sacral Chakra and is associated with the sexual organs and reproductive systems. It can symbolize happiness and love. We store our feelings, emotions, pleasure, sensuality, intimacy and connection in this domain. How deserving do you feel? When you feel that you deserve good, you treat yourself well and require that others treat you well also. When the Sacral Chakra is clear and the energy is in balance, you are friendly, compassionate, and empathic with a concern for other. You will experience a very strong sense of belonging. There is an essence of sacred sexuality here, of sensuality. Luxuriating in the senses. Being in the moment. Making connections that matter. Lasting friendships, deep relationships. Delving into the soul of another. It may be romantic, it may be platonic, but there is intimacy, truth, authenticity. All the things that matter most. Bonds are formed or strengthened. Acceptance, allowance, and Unconditional Love is key. There is creativity here, manifestation. Co-creation. Making of things that are important; vital to the future. Building something structurally sound, a foundation that will hold steady under pressure. Harmony between body, mind and spirit. A meeting of the minds. Self-belief, balanced self-worth. Confidence, self-expression. Creativity. Anything is possible. Wear orange if you can get away with it. Hold, wear or place under your pillow a carnelian crystal. Lie down and place it a couple of inches below your belly button on your abdomen and let it work its magic, clearing, empowering. Meditate. Breathe all the way in, deep into your belly, feeling it rise and fall. Do something interesting today. Shake things up a little. Don’t hesitate. Don’t think too much about it, just go for it. Have a little adventure. Flirt a little. Surprise someone special. Plan a date night. Make a fancy supper. Indulge a little. Splurge. Splash out. Harness the energy of Harmony, of joy, happiness and connection. Pull yourself into the moment. Look around you. Take time to experience deep gratitude for all the magic.